HISTORY... The Dry Tortugas National Park is located 70 miles west of Key West. It consists of seven tiny islands and the surrounding waters. When Ponce De Leon originally discovered these islands he named them “Las Tortugas” (meaning “the turtles” in Spanish) because of the abundance of sea turtles. Even though hunting drastically reduced their numbers, many varieties of the species are still present in the area. Located on one of those islands, Garden Key, is historic Fort Jefferson. Built in the mid-1800’s, with over 16 million bricks, this is America’s largest coastal fort. Originally constructed to protect the important Gulf of Mexico shipping lanes, Fort Jefferson was used as a military prison during the Civil War. During this time, it was “home” to Dr. Samuel Mudd, who was convicted of complicity in the assassination of President Abraham Lincoln. BIRDWATCHING... John James Audubon first visited the Dry Tortugas in 1832. The area was made a marine sanctuary in 1908. Every year, between March and September, some 100,000 sooty terns gather on Bush Key for their nesting season. Throughout the year magnificent frigate birds, brown pelicans, double-crested cormorants, and many varieties of land and water birds can be spotted. SNORKELING... Directly accessible from the beaches are the Fort Jefferson snorkeling areas. The shallow waters (5-15 feet) make this area perfect for beginners and experts. You will see colorful corals, many varieties of tropical fish, starfish, queen conchs, and much more in this protected marine sanctuary. CAMPING... A camping trip at the Dry Tortugas National Park is an unforgettable experience. The Sunny Days Key West FAST CAT can provide transportation for up to six camping passengers to the park every morning at 8 a.m. To learn more about the Camping Rules and Regulations at the Dry Tortugas, as well as aboard the Fast Cat, please follow these links: Dry Tortugas National Park Fast Cat Guidelines for Campers Sunny Days "Fast Cat II" We get you there faster than any other boat! About Our Boat... 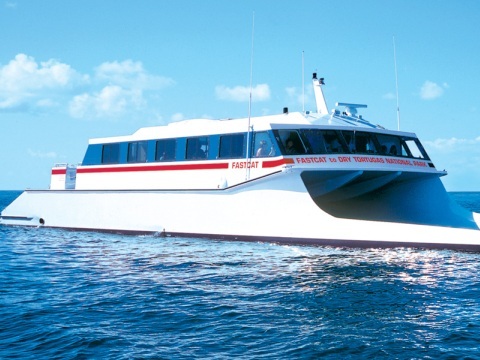 Launched in May 1999, the "Fast Cat II" is a high speed power catamaran. The cool air conditioned cabin provides comfortable indoor seating. A rear sundeck is available for outdoor seating. The innovative wave piercing design means a smoother, more pleasant ride. Dramatically fewer people experience motion sickness on catamarans. The "Fast Cat II" is a one-of-a-kind design. Come experience the difference... What to expect: 2 hours of travel time, each way. 4 1/2 hours at Fort Jefferson. Continental breakfast upon boarding. A tour of the Fort by one of our knowledgeable guides upon arrival. Buffet lunch served in the picnic area of Fort Jefferson. Complimentary soft drinks, water & iced tea throughout the day. Snorkel gear. Freshwater rinse on board.